Perhaps the greatest feature of CG is our extraordinary Community Garden and Urban Farm project. 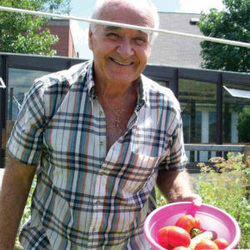 Our residents have the opportunity to plant, tend to, and harvest fruit, vegetables and flowers in their own private garden, tilled and prepared for them by our in-house gardener. For those looking to be more involved, there are endless opportunities to work in the large Urban Farm beds around the property. If you do not have a green thumb, you can still enjoy the home-grown, organic produce from our gardens, offered to you right on our property during weekly Farmer’s Market sales. Best of all, the prices are lower than what you would pay at the grocery store! Luscious peaches, pears, apples, berries, tomatoes, cucumbers, peppers, eggplant, zucchini and lettuce are just some of the organically grown delights. 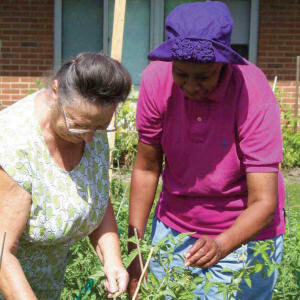 The bounty of the labor of our resident “farmers” reaches beyond fruit, vegetables and flowers, and into the hearts of every person who has experienced the joy of giving. 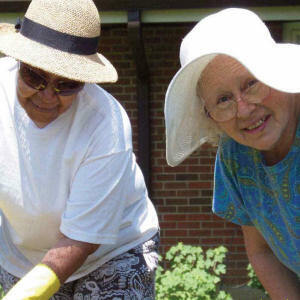 Through a Tenant Gardening Committee, many of our tenants are involved in the decision-making process, as well as in the daily development of the Garden Project. Community Improvement Award from the City of Cleveland Heights.